Why Buy A Replacement Chain? There are several reasons to have a replacement chain available, and many of them have to do with protecting the life of your saw. Dull chains turn your saw into a grinder, and grinding wears on the motor components. A replacement will also protect your saw if you need a different cutting angle for a different style of cutting; for example, a semi-chisel with rounded corners is recommended for working in dirt, clearing stumps and other rough work. Ripping planks is a very different action for the saw to complete than bucking firewood. When ripping, you work along the grain. Bucking means you have to cut across the grain. Having the right chain on the bar will keep you safer and lead to a cleaner outcome on the cut wood. A full-skip chain has half as many teeth as a standard. Full-skip chains are a great option for those working with long bar saws while cutting soft wood. The non-cutting links in your chainsaw chain are what carry away the wood chips. If you have a large log to cut into sections, a full-skip chain will clear the kerf more quickly and efficiently. As a general rule, full-skip chains are harder to control and most likely to kick back or grab at the bar. They may be the fastest cutting chainsaw chain around in some applications, but an inexperienced user may find that this saw will cut more than wood. If you're not extremely experienced on your chainsaw, you'll be much safer using a standard chain. Standards make the cleanest and most consistent cuts. Not all 18" bars will allow you to put an 18" chain on the tool. Review your saw carefully and study the existing bar for any compatibility issues. Be aware that your bar may become worn over time and the restrictions relating to chain requirement may no longer be visible; whenever possible, go back to the manufacturer to find a chain to fit your brand of saw. This isn't always exact, but it's the first step in saving yourself a lot of frustration. Your first step when changing out your chainsaw chain is to be sure you have your replacement chain nearby and that it will fit. If possible, match it to the pitch numbers on the bar. If the gauge is wrong, the drive links are too thick and the chain won't drop down into the bar. Make certain that the brake release is loose before you remove the nuts holding the chainsaw bar cover in place. Once the cover is off, draw back the chainsaw bar until the chain is loose enough to remove, loop your new chain over the gear drive on the motor and over the top of the bar, making sure to seat it in the sprocket at the bar tip. You can then manually snug up the chain by sliding the bar forward. Replace the bar cover, finger-tighten the nuts and do a final snug on your chain at the tensioner screw. Finally, tighten down the cover nuts. As possible, match your replacement chain to your cutting tasks. For example, a semi-chisel cutting link may be the best chainsaw chain for cutting firewood, but not the best chainsaw chain for hardwood. A diamond-tipped chainsaw chain sounds ideal and fast, but these chains are designed to be used on a concrete chainsaw. These chainsaws are unique in that water is applied to the blade as you cut to keep things cool, which is not a great option when cutting firewood. ​​​​​The most aggressive chainsaw chain is the one with the best edge. If you find yourself constantly replacing chainsaw chains, take a good look at your cutting conditions. A square chisel chain may be the best chainsaw for cutting hardwood, but if you're grubbing out tree roots, you'll turn this very nice cutting edge into a blunt instrument in the course of an afternoon, and these edges can be hard to sharpen. A replacement chain is a great time to consider adding a new chisel to your arsenal. Consider investing in a round chisel for clean conditions and sharpening your semi-chisel for the next round of dirty work. The Oregon S56 is designed for low-vibration and little kickback. This chain features a 3/8 pitch chain, which is a very common pitch, so if you have an old saw that you can't find a replacement chain for, this may be just the tool to resurrect your machine. This chain is built to run smooth, but don't scrimp on your hand safety gear. Chatter-resistant gloves are critical for anyone planning to run a chainsaw for an extended period of time. Semi chisel chains are a great middle of the road cutting tool; while it may not cut as fast as a round or square chisel, it will hold an edge longer and can tolerate dirt, such as if you need to clean up stumps. The 26RS is a great replacement chain for many Stihl chainsaws. The .325 pitch is a little shorter than professional grade, so be sure to check your saw blade for the best Stihl chainsaw chain for your machine. If you're new to chainsaw terminology, pitch refers to drive links and the distance between them. Using a chain of the wrong pitch can destroy sprockets that rotate the chain forward and the clutch of your saw, so be sure you use a chain with the right pitch for your bar! Users find this chain to be an excellent replacement option; often noting that this new chain is sharper than the one that came with their machine. The Stihl 26RS is a great chain for hardwood or seasoned logs. The Husqvarna 531300439 is a great option to use while you primary saw chain is in need of sharpening. Many users find that this chain will lengthen a lot when it gets warm and may slip off the sprockets. As explained in this video, adjusting chainsaw tension isn't difficult if you take care of it immediately, but a slipped chain can cause serious injury to you and users around you, and may damage both your saw and the chain itself. While the H30-72 is easy to sharpen, you will need a Husky file and file gauge to get the proper angle and the best edge. This is a great backup chain, but not the best primary chain option. The Poulan 952051310 is designed for low chatter and low vibration, so if you're hoping for a quiet afternoon of cutting with your electric saw, this may be the chain for you! Poulan offers a color coding system on their chains; your replacement saw chain box should fit if it matches the color of your tool. However, whenever possible be certain to confirm the pitch, or you may damage both the sprocket tip and the clutch on your saw. The 952051310 will work well enough as a replacement blade, but many users find that the short pitch doesn't clear away the wood chips and dulls fairly quickly. While this chain is quick to install as a replacement blade, it's a challenge to sharpen. Taking your chains to a professional sharpening shop will cost you time and money, so make sure to invest in enough extra saw chains to keep your machine up and running when you need it. Users of Greenworks saws will likely find that this chain will fit their 18" saw bar. Greenworks yard tools are all either electric or battery-powered, so while this is not a professional grade chainsaw chain, it's cost-effective as a spare and quite easy to sharpen; a 5/32 round file will put a new edge on your cutting links. Some users recommend a quick filing after each cutting session to speed up your chainsaw tasks. Be aware that a dull saw blade will get hot, and that can cause links to expand and your chainsaw chain will develop some slop along the bottom edge. While gloved, turn the saw off and tug at the chain along the bottom edge of the saw. If the drive teeth of the chain are visible, the saw needs to be tightened slightly. Greenworks suggests that this saw chain will work with most 18" chainsaw bars; as ever, measure repeatedly before installing any new chain on your saw. The risk of slippage can be dangerous. 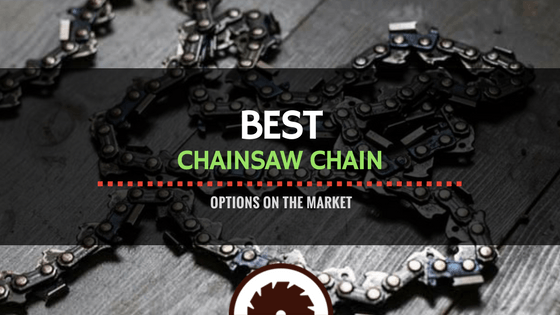 The best chainsaw chain of 2018 for your saw is the one that fits just right so you can get back to cutting safely and efficiently. Of course, every saw brand is different. However, there are factors that universally apply to upgrading your chainsaw chain. For ease of sharpening, durability, and universality of fit, the Oregon S56 16-Inch Semi Chisel Chain Saw Chain is an excellent option. Thanks to the many replacement Oregon bars on the market, the Oregon chain may be the best chainsaw chain brand to work with if you've replaced your chainsaw bar. It won't fit all saws, but if you have a saw that can run this chain, you'll have an easy to install, easy to sharpen and durable cutting tool in your arsenal. A well-sharpened, well-tuned chainsaw is safer to use, easier to work with and just plain fun to handle. Enjoy!